Buy Resident Evil: Afterlife or other Resident Evil films from Amazon. You too can earn money from writing articles by signing up for InfoBarrel. Resident Evil: Afterlife is the fourth in the series of films based on the survival horror video game series. It begins on a street in Tokyo with a J Pop Girl (Mika Nakashima) standing in the rain without an umbrella as the crowds pass around her, before she suddenly attacks one of them and tries to eat him, ripping his neck open with her teeth. The infection spreads and the planet goes dark. Events then move forward four years, and back in Tokyo the street are now filled with abandoned cars and the dead - some still walking around, although these are being shot by guards. The guards are killed off by an unknown force and, beneath the streets, there is the headquarters of the Umbrella Corporation, where Chairman Wesker (Shawn Roberts). As the facility's guards try to defend the place, they are quickly killed by Alice (Milla Jovovich, Resident Evil, The Three Musketeers) - before she, too, is killed. Then three more Alices appear - as Alice said at the end of the previous film, Resident Evil: Extinction, she has brought some friends with her, the various clones of herself that the other facility had created. Credit: https://en.wikipedia.org/wiki/Resident_Evil:_Afterlife#/media/File:Resident_Evil-_Afterlife.jpgSix months after the attack on the Tokyo Umbrella Corporation facility, Alice is in a small plane heading for Alaska. She is searching for Arcadia, where Claire Redfield (Ali Larter) had led the other survivors at the end of Resident Evil: Extinction. At the location in question, Alice finds only abandoned planes, and Claire's helicopter. The only person there is Claire; otherwise, the place is deserted. After that, the pair head south in Alice's plane to an oddly - given that it's years since the zombie apocalypse hit the place - still burning Los Angeles. Alice spots a message on the top of a building, a prison which is surrounded by zombies, and lands her plane on the top of it. There are a handful of survivors inside the prison, and together they attempt to escape from the ruins of LA. The fourth film introduces two new types of monsters for the cinematic series, one being Mejini, the other a giant zombie that was created just for the films. The film is available in both 2D and 3D with the 2D version being the one watched. Many of the combat scenes have been clearly shot to take advantage of 3D, as various weapons would appear to have come flying out of the screen, especially as many of the combat scenes have been filmed in slow motion so that the viewer can fully appreciate those weapons - if they had gone at normal speed, they wouldn't have been as visible. There are in fact a lot of slow motion scenes in the film, creating an effect strongly reminiscent of The Matrix, and it's possible that they may have gone a bit overboard with them. There is quite a lot of violence in this, although mostly against the infected, but some of the living do, of course, end up dead, especially when Alice is assaulting the Umbrella Corporation's headquarters. The plot doesn't really bear much thinking about, as too much contemplation of it will reveal that parts don't make a lot of sense. watch out for the mid-credits scene which ties into the next film in the series, Resident Evil: Retribution. 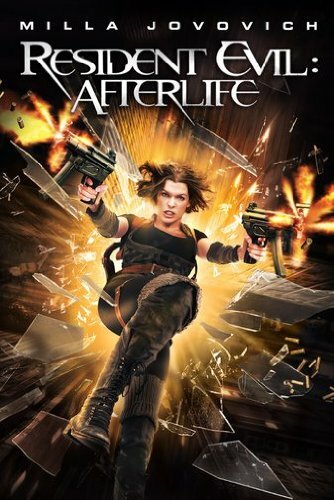 Resident Evil: Afterlife is a flawed film, but still quite fun to watch, and definitely not the worst in the franchise.